Approximately two years ago, Dan and I planted a jalapeño plant and a habanero plant. They grew, and they grew, and then they flowered… but our apartment didn’t get enough light (or heat) for them to bear fruit. So they sat, for years, just barely hanging on. Until we moved into this great apartment that has a yard! and full sun! and they got huge and started throwing dark green leaves out and finally, after so much waiting, came the flowers. And slowly the flowers dropped and left behind tiny little peppers. We were so excited. We danced, we counted future peppers, and I started roasting and pickling peppers in my mind. First the habanero put out a pepper. More excitement. More staring at it creepily as it grew. Some concern about what we were actually going to do with a habanero. Then came the jalapeño. I started picturing future salsas. Oh, the huevos rancheros. But then something happened. The jalapeño stopped getting longer. Instead, it got fatter. It looked, weirdly, just like the habanero. Do you know where this is going? You must. You’re thinking duh! it’s not a jalapeño, dummies! you planted TWO habaneros! We did. 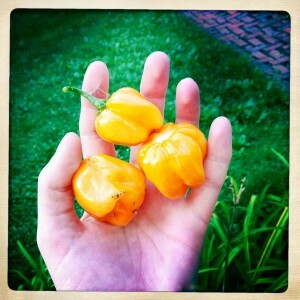 Without realizing it, we harbored two habanero plants for years, the whole time dreaming about our wonderful jalapeños. Because while I can handle a jalepeño, habaneros are the kind of vegetable that make me step back. Blink. Wonder what the hell I am going to do with a pepper that makes a grown man cry. And not just one, but dozens. You know what plants that haven’t been able to successfully reproduce for two years do? THEY GO BUCK WILD. 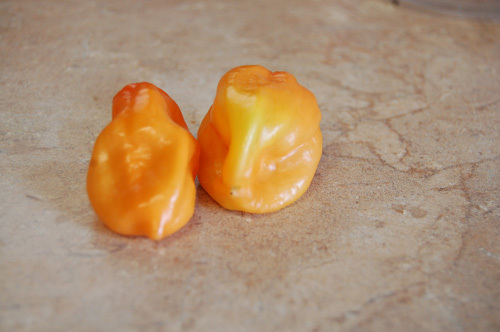 We are swimming in habaneros, and I am having a nervous breakdown. Thankfully, I have figured out a few things to do with habaneros. First, I took a bunch down to my father’s house and then left under the cover of darkness. Secondly, in a method more relevant to this food blog, I used them to create an underlying spice profile within a sauce. My brilliant husband suggested that I pierce the habanero and let it simmer in a sauce, so that it might lend its flavor (ie heat), but not overwhelm anyone’s senses. And it was such a hit. 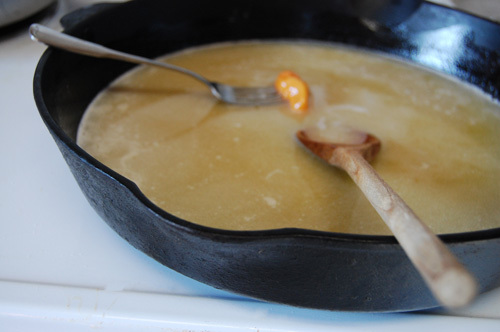 I simmered a habanero in this brown butter brown sugar sauce for about an hour and the result was a dish that had afternotes of spice, and a low, consistent heat. It was tasty and I was, thankfully, one habanero down. In other news, this past weekend was the final weekend of performances for the water ballet I mentioned. The ballet, Jason and the Aquanauts: 20,000 Legs Over the Sea was based on the movie of a slightly different name. My scene, in which the hero Jason battles a skeleton army, was clearly the best. I’ve included, as proof, the video of our scene and my makeup for the shows. Terrifyingly awesome, I know. 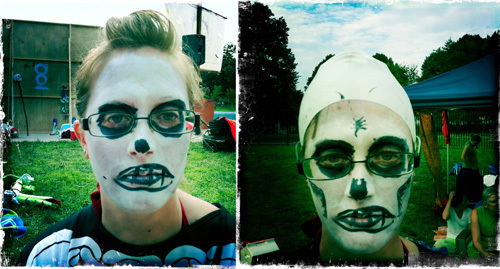 Jason & the Aquanauts: Skeleton Scene from elena rosemond-hoerr on Vimeo. 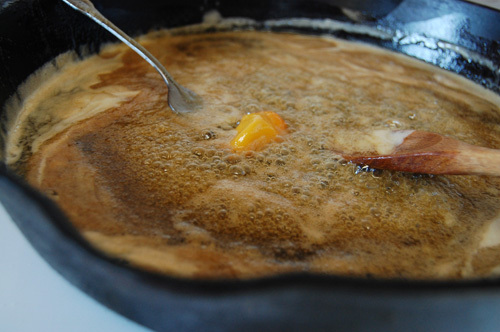 Put a large skillet over medium low heat. Melt butter. Stir in brown sugar. Pierce whole habanero with a fork. Place the fork in the butter mixture. Allow to simmer for 1 hour, stirring occasionally. 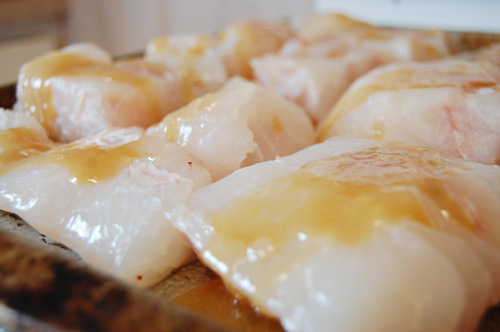 Pat your grouper dry. Sprinkle with salt and pepper. Place on a broiling pan. Drizzle with butter mixture. Broil on high 10 minutes. 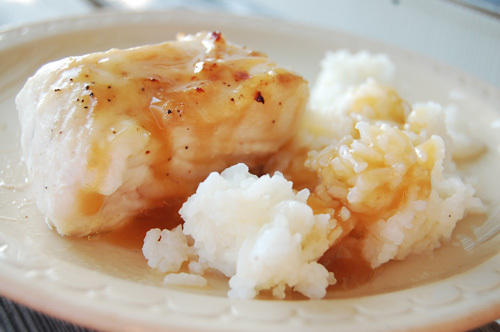 Serve over rice, topped with butter sauce. UPDATE: THEY’RE GETTING BIGGER BY THE MINUTE! We love spicy. We love heat. But…We bought some peppers at the Highlandtown farmers market this weekend and they turned out to be just a little more heat than we expected. Must have been some highly stressed peppers to produce the heat we were experiencing. Next day we brought them across the street and gave them to my boyfriends father (he claims to like spice/heat as well). He was silly and took a bite of pasta and then a bite of pepper. I swear I saw flames shoot out of his ears. I love the cute pic of your little orange peppers. So innocent looking…. It was great to meet you tonight! I hope to keep in touch! It was great to meet you Cara! Hope to see you again in September.